PEACE OF MIND: Life Jacket 3 offers an additional measure of security, whether traveling or at home, by securing your firearm and denying trigger access. A heavy duty locking mechanism helps to prevent unwanted access to the functional parts of your firearm. SOLID EXTERIOR, SOFT INTERIOR: LJ3 features a hardened polycarbonate enclosure with a soft padded foam interior. 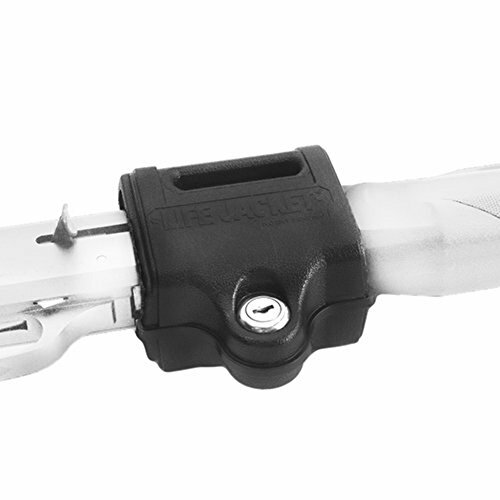 LJ3 has a specifically designed "chamber lock" that effectively plugs into the chamber. PREVENTS PUSH THROUGH: Solid steel 2-part hinge pins with a rigid divider helps prevent push through. Our Life Jacket is also reinforced with an embedded steel cable around the perimeter of the Life Jacket. VERSATILITY: Life Jackets are more secure than a standard trigger lock and more portable than a safe, offering you a product that is versatile, yet effectively promotes responsible firearm storage, transport, and safety. COMPLIES WITH STRICT TESTING: Our LJ3 is tested and approved by the California Dept. of Justice (meeting or exceeding the requirements of California Penal Code Section 12088 and the regulations therein).